When you arrive in Cusco you will be met at the airport and transferred to your hotel conveniently located close to Plaza de Armas. Overnight in Cusco. Today is your introduction to the amazing Inca culture and ruins in and surrounding Cusco. Your half day guided tour will include close inspection of the amazing stone walls of the former Inca palaces on the colorful main square of Cusco. You will then travel to the hillsides surrounding the city to visit several nearby ruins which may include Tambo Machay, Kenko or the massive fortress of Sacsayhuaman. Overnight in Cusco. After an early breakfast, travel by train down the rugged gorge of the roaring Urubamba River to Machu Picchu. 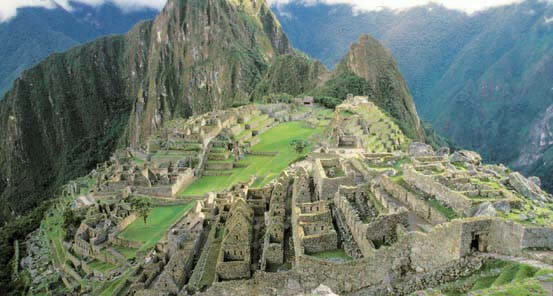 This famous "Lost City of the Incas" is one of the world's most memorable archeological sites. Our guide will give a tour of the site before returning to Cusco, leaving the afternoon free to continue exploring the site, or to return to our lovely hotel by the side of the river in Machu Picchu Pueblo (formerly known as Aquas Calientes), the town below the site. A second day at Machu Picchu allows time for individual exploration of the dramatic site and a chance to contemplate its man-made wonders. Ambitious hikers may consider hiking to the top of Huayna Picchu. This strenuous hike takes between two and three hours and provides spectacular views over the site of Machu Picchu. Another option is to follow the shorter and less demanding trail to the Sun Gate. In the late afternoon we return by train to Cusco for overnight. 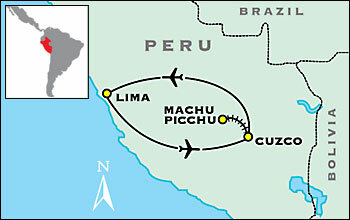 Today, You will be transferred to Cusco airport for your onward flight connections.